2015 BMA Medical Book Awards Highly Commended in Radiology Category! Diagnostic Ultrasound: Musculoskeletal was written by leading experts in the field as an ideal source for the high-intensity radiological and clinical practices of today. This quick, up-to-date reference employs a user-friendly, practically applicable format and is well suited for radiologists, sonographers, rheumatologists, orthopaedic surgeons, sports physicians, and physiotherapists alike. Complete coverage of ultrasound anatomy, diagnosis, differential diagnosis and ultrasound-guided interventional procedures combines with thousands of illustrative clinical cases and schematic diagrams to make this new resource among the most comprehensive available on the market. Readily accessible chapter layout with succinct, bulleted teaching points and almost 3,000 high-quality illustrative clinical cases and schematic designs. All-inclusive section on musculoskeletal ultrasound anatomy, as well as a comprehensive interventional section covering muskuloskeletal ultrasound. Approaches musculoskeletal ultrasound from two different viewpoints: that of a specific diagnosis (Dx section), followed by that of a specific ultrasound appearance (DDx section). Differential diagnosis section features supportive images and text outlining the key discriminatory features necessary in reaching the correct diagnosis. 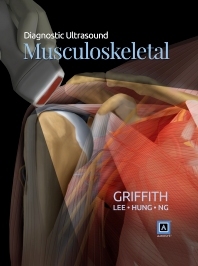 Provides a solid understanding of musculoskeletal ultrasound anatomy and pathology. Comes with Amirsys eBook Advantage™, an online eBook featuring expanded content, additional images, and fully searchable text. Professor James F. Griffith is an academic clinical radiologist working at The Chinese University of Hong Kong. He has 25 years of experience working with musculoskeletal ultrasound in a clinical setting from the initial inception of high-resolution ultrasound into clinical practice. He is a Head of a busy Musculoskeletal Imaging Unit covering all aspects of musculoskeletal imaging, including ultrasound, CT, MR, PET/CT and intervention. This imaging cross integration allows him to fully appreciate the benefits of ultrasound in the work-up and treatment of different musculoskeletal conditions. He has published nearly 300 peer-reviewed papers on various aspects of musculoskeletal imaging, as well as conducting and participating in at least 40 musculoskeletal ultrasound workshops.